I haven't done one of these in a loooooong time and thought I'd share how our first day of summer break went! 8:15 – I wake up freezing. I check fb and email on my phone then roll out of bed to start some coffee. 8:25 Coffee is ready and the very loud garbage truck drives by. 8:45 I tackle the dishes and kitchen clean up. 9:00 Isla is done eating so we move to the living room for her morning Elmo time aka mommy’s drink coffee in peace and catch up on the Internet time. 9:08 Back to her own chair with Elmo book while watching Elmo. She may have a problem. 9:30 – Isla wants to go outside but we need to do laundry and get dressed first. So we go downstairs, throw a load in, color an Elmo coloring page, then head upstairs to get dressed. After she’s dressed I send her out to finish the Elmo episode so I can get dressed. 10:00 About to head out the door for Target when my friend calls and wants us to meet up at the park. So I throw snacks in the diaper bag, dinner in the crock pot and we go play outside with her Little Tykes grill for a bit while I try to get her trike in the car --- FAIL. 10: 25 We leave and got gas and met up at the park where a TON of kids are riding trikes and having a blast in the water area. 11:45 Isla is HANGRYYYYYY. We eat almost all the snacks I brought and manage to convince her to head home for lunch. 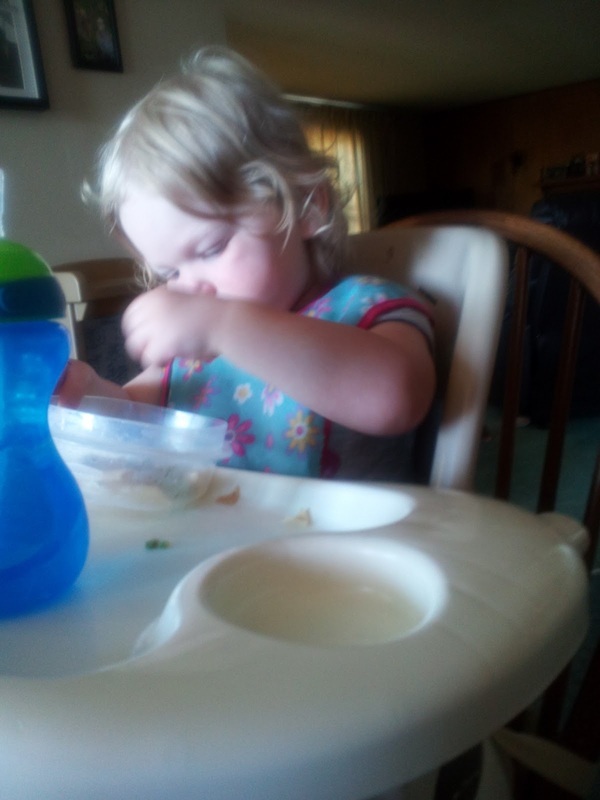 12:10 She eats leftover pasta, broccoli, corn and an orange for lunch.. I also ate leftovers. Only photo of the day. Tried at the park but she kept running away and/or showing me her belly and she hates her photo taken anyway so I sneak them in! 12:31 I read Elmo’s ABC book, again. Then, Itsy Bitsy Spider (Elmo version), and a book about colors. Then we put together Miss Potato Head whom I swear looks like a potato head drag queen. Then she looks sleepy so at 12:50 I put her down for a nap. 1:00 I grab a diet coke and sit down to catch up on my shows. First up, Rookie Blue. Then I couldn’t figure out our DVR so I put an episode of Blue Bloods on in the background and read some of my book, The Book of Ruth until she woke up at 4:30!!!! 4:30 Snuggles and goldfish snacks. 4:50 I set her up with a laminated letter ‘I’ sheet and play dough while I took the chicken out of the crock pot, shredded it and prepared enchiladas and made guacamole. 5:40 Dinner is served. And my husband walked in the door 5 minutes later. 6:15 We all head outside for a walk that ended up being only two houses down because we took her trike and passed the cows and we then had to go back on the farm and look at the cows and donkey. Came back and planted some pansies I got as a gift and played with the toy grill again. 7:25 We put on Gilmore Girls and play with blocks and daddy now reads Elmo’s ABC book. 8:00 I jump in the shower and 2 minutes into my shower Isla is put down to bed by her daddy. 8:15 We start watching The Voice results show. 9:00 I catch up on two episodes of Armywives. 10:35 Read more of my book. 11:00 To bed I said! A very busy, yet fun and somewhat relaxing first day of break. Today? Has been a bit more whiney but I'm trying to push off outside time because we have an outdoor lunch date and I don't want her too tired for the fun! What shows do you catch up with on DVR? Do you have a million like I seem to have? ha..